High Quality Content by WIKIPEDIA articles! Free improvisation or free music is improvised music without any rules beyond the taste or inclination of the musician(s) involved; in many cases the musicians make an active effort to avoid overt references to recognizable musical genres. The term is somewhat paradoxical, since it can be considered both as a technique (employed by any musician who wishes to disregard rigid genres and forms) and as a recognizable genre in its own right. 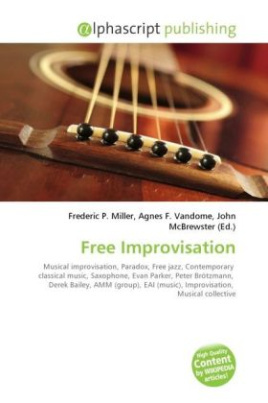 Free improvisation, as a style of music, developed in the U.S. and Europe in the mid and late 1960s, largely as an outgrowth of free jazz and modern classical musics. None of its exponents can be said to be famous amongst the general public; however, in experimental circles, a number of free musicians are well known, including saxophonists Evan Parker and Peter Brötzmann, guitarist Derek Bailey, and the improvising group AMM.